All of the flavor of fried artichoke hearts, with added ease and accessibility! Place 3 inches of oil in heavy pot over medium heat (or use deep fryer if available). Use discarded Brussels sprout leaves to test oil temperature. When leaf immediately sizzles and crisps upon entering the oil, the temperature is right. Fry Brussels sprouts in batches, draining on paper towels when golden brown. Sprinkle with salt. 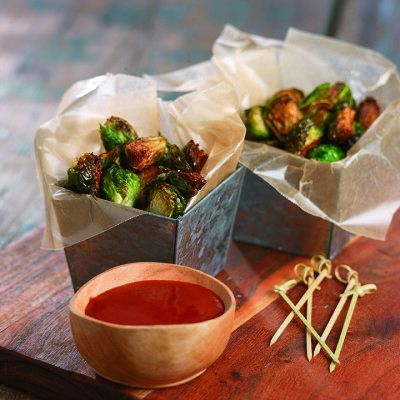 While sprouts are frying, mix sriracha with soy sauce and lime juice. Serve as dipping sauce alongside of sprouts.